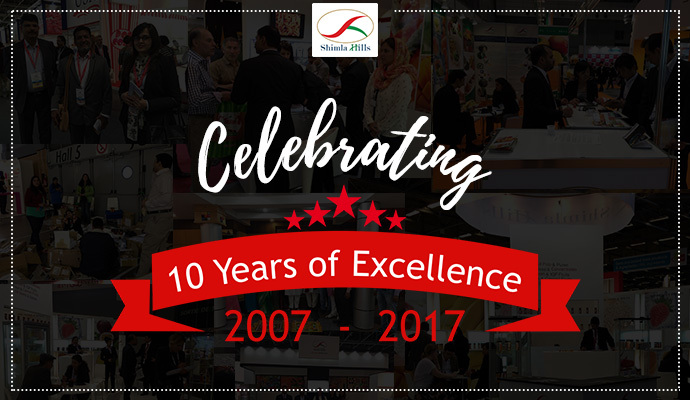 Shimla Hills is escalated with joy at it announces its 10 successful years in the agro-products industry. The decade that passed by was packed with product portfolio enhancement, innovation, and growth. The continuous improvement in the manufacturing prowess, endeavor for sustainable growth & development, visit to a large number of national and international food events such as SIAL Paris, Foodex Japan, Gulfood Manufacturing, World Food Ukraine, etc., adherence to stringent quality manufacturing, and packaging processes, the past decade witnessed it all. The commencement of the Shimla Hills journey dates back to the year 2007 when it began its operation by exporting canned mushrooms to Israel. With the passage of time, it forayed in a plenty of production processes, products and countries. Since its inception, Shimla Hills has been focusing on expanding its product portfolio yet maintaining the quality and keeping the packaging standards intact. Today, the organization has an extended database of renowned clients spread across various countries of the world. It continuously strives to delight all of them with its premium quality offerings and ensures to further cement the bond and trust. As Shimla Hills steps into its 11th year, it makes sure to serve all its stakeholders with quality products and services. It also heartily thanks them for making the journey so far possible. It also hopes them to be always there in the years to come.